No. 1 - No. 6 (1971). Individual issues ca. 1-49 pp. GENRE: journal. Title in English "Democrat" (ALEX 309). Start year 1971 (SDSA No. 23). 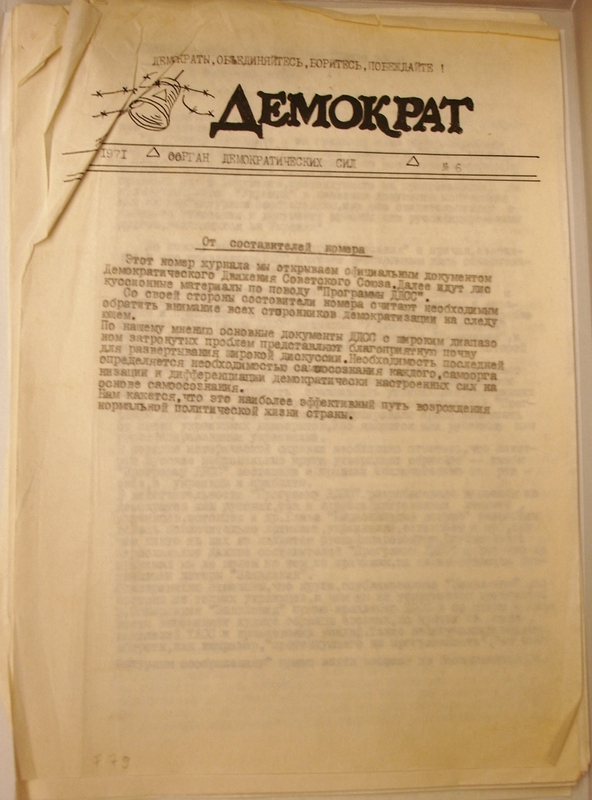 Sergei Soldatov and the Democratic Movement of the Soviet Union (Demokraticheskoe dvizhenie Sovetskogo Soiuza) (SAMB No. 127/1983) (SLOW 74). Source claims 7 issues, unconfirmed (SLOW 74). No. 1/1971 (AS 1152-a) in SDSA 23 (title). No. 2/1971 (AS 1152-b) in SDSA 23 (title). No. 3/1971 (AS 1152-v) in SDSA 23. No. 4/1971 (AS 1152-g) in SDSA 23. No. 5/1971 (AS 1152-d) in SDSA 23. No. 6/1972 (AS 1152-e) in SDSA 23 (partial reprint) (1971 elsewhere). Published in SDSA 23 (title). Dated 1972 in SDSA 23.